As a cat owner, it is frightening to see your beloved feline suffer from a seizure or other mysterious episode. Yet, neurological disorders can occur in cats, just as they can in humans. In fact, similar to humans, a cat's central nervous system includes a complex network of nerves that work with the brain and spinal cord to send messages to the body. The brain sends signals through the spinal cord, that then travel to the nerves, telling organs and muscles how to function. When something in the body—such as a tumor or infection—interferes with these signals, a variety of problems can occur. Some neurological diseases can be treated with medicines, and others with surgery. Either way, treatment is essential to avoid chronic pain, poor quality of life, or even death. What Is a Neurological Disorder? Neurological disorders result from a disruption to or an illness that affects your cat's central nervous system. If the issue is in the brain, seizures may be present. However, an infection in the spinal cord may result in an unsteady gait, problems with limb functioning, or complete paralysis. A disruption of nerves can affect almost any part of your cat's body including its face, mouth, legs, or paws. And since the nervous system affects most of your cat's major bodily functions, issues with balance, speech (meowing), eating, and defecating can also be present if it has a neurological issue. A large range of symptoms can accompany a neurological disease. However, a cat can't tell you if she's dizzy, disoriented, or depressed, so looking for physical representations of distress is crucial in diagnosis. First, there are obvious symptoms like seizures, sudden blindness, an inability to walk or walking with a drunken gait (ataxia), or even full paralysis of the face, limbs, or body. Things like muscle twitching or tremors may be harder to spot and might require spending some quiet time studying your feline friend. Take note if your cat is acting disoriented or confused, has abnormally rapid eye movements (nystagmus), or starts walking in circles, as this could be a sign of something serious. And if you notice any of these signs, call your veterinarian to schedule an immediate examination. A complete neurological evaluation must be conducted at a vets office. First, your veterinarian will ask about your cat's medical history. Then, he will perform a comprehensive physical examination. This includes checking your cat's reflexes, inspecting its eyes, and assessing its pain. 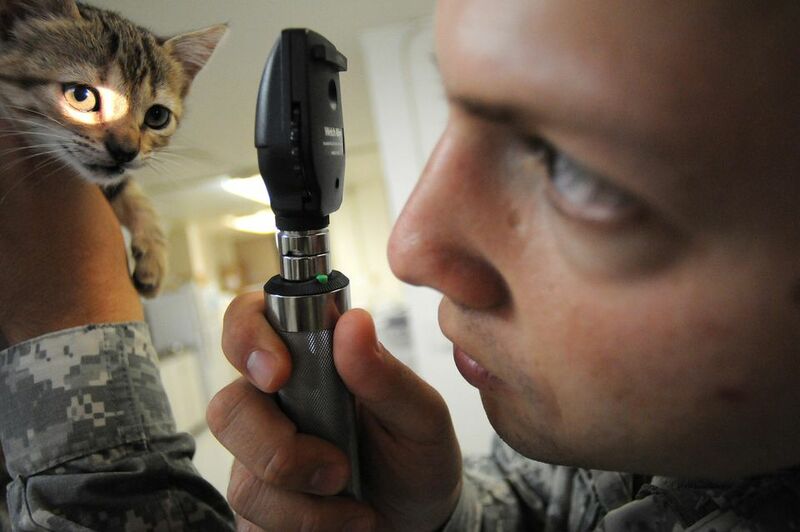 In many cases, the vet will also want to watch your cat walk or move around. Your vet may recommend additional diagnostics, like lab work, based on the outcome of the examination. A complete blood count, blood chemistry, and urinalysis may be ordered, and a thyroid test will rule out feline hyperthyroidism, which can sometimes present itself with neurological signs. Your vet may want to check for high blood pressure, too, as this can also affect the central nervous system. X-rays of the limbs and spine can reveal obvious issues, like spinal trauma or large tumors in the body. Still, if your vet is unable to determine the exact cause of the symptoms, you may be referred to a veterinary neurologist who will review the findings and possibly recommend an MRI or a CT scan to check for tumors, inflammation, or other abnormalities. A cerebral spinal fluid tap may also be ordered, which allows for microscopic analysis of the spine, potentially revealing the presence of infection, blood, and other abnormal cells. Most likely, a vet's examination, combined with a few diagnostic tests, will unveil the cause of your cat's neurological dysfunction. In addition to tumors, abnormal growths, and infection, certain toxins can also affect the central nervous system (in the event your cat was exposed to poison). Also, parasites such as toxoplasmosis have an impact on the brain. And infectious diseases like FIV, FeLV, or FIP can cause similar symptoms, too. A complete look into the spinal fluid will tell the vet if these issues are a product of abnormal cells or blood in the spinal column. Treating neurological disorders in cats starts with diagnosing the disorder, and care varies greatly between diagnoses. Treating Seizure Disorders: Seizures—sudden episodes of abnormal electrical activity in the brain—usually involve some loss of body control, such as twitching, convulsing, and involuntary urination/defecation. Cats may have seizures for a variety of reasons. But when advanced diagnostics reveal no exact cause, the cat is usually diagnosed with epilepsy, typically treated with medication. If your cat has epilepsy, it's important to communicate with your vet regularly and return for follow-up visits after starting a treatment protocol. Treating Meningitis and Encephalitis: Meningitis, inflammation of the membrane that covers the brain and spinal cord, and encephalitis, inflammation of the brain, are usually caused by infection (bacterial, viral, fungal, or parasitic). These two conditions may occur at the same time (meningoencephalitis), and in some cases can signal a problem with a cat's immune system. Treatment includes the use of corticosteroids to reduce inflammation and alter the immune system. Antibiotics, antifungals, or antiparasitic drugs are also used when indicated. Supportive care can include fluid administration, pain management, and nutritional supplements. Treating Vestibular Disease: Vestibular disease occurs when there is pressure on the nerves that control the vestibular system in the ear canals, often causing vertigo in cats. Cats may seem drunk or dizzy, tilt their head, or show rapid abnormal eye movements. A major ear infection or tumor can lead to vestibular dysfunction, or meningitis, encephalitis, or meningoencephalitis could be the culprit. Treatment depends on the actual cause of the dysfunction. If an ear infection is present, your cat may need ear drops and oral medications. Supportive care is given when needed. Treating Cognitive Dysfunction: Cognitive dysfunction, or dementia, is most common in senior cats. Cats with dementia seem to "forget" how to use the litter box, where the food bowl is, and how to navigate through the house. There is no cure for cognitive dysfunction, but some medications and nutritional supplements can slow its progression. Treating Intervertebral Disc Disease: Intervertebral Disc Disease (IVDD), or disc herniation, involves the inflammation or displacement of spinal discs, which ultimately put pressure on the spinal cord, leading to pain and possible paralysis. Though more common in dogs, IVDD can sometimes occur in cats. In mild cases (when the pet can still walk), vets may try an approach that includes rest, anti-inflammatory drugs, and muscle relaxants. Surgery is often the only treatment for severe cases. Unfortunately, brain tumors are a relatively common cause of neurological dysfunction in cats. And they can spark a myriad of issues like seizures, trouble walking, blindness, or behavioral changes. It all depends on the size and location of the tumor. Benign tumors called meningioma (a relatively common occurrence in cats) can often be removed easily with surgery and cats with operable meningiomas usually live completely normal lives after tumor removal. Without surgical removal, however, this type of tumor may expand, leading to more neurological dysfunction. Cancerous brain tumors also occur in cats. If the tumor cannot be removed with surgery, radiation and chemotherapy may be helpful. However, the prognosis is not good and only one-third of pets treated by aggressive cancer therapies will live for two years or more. Preventing neurological disorders in your pet may be impossible to do, but maintaining a healthy lifestyle keeps any cat in tip-top shape. Feed your cat a high-quality, grain-free food throughout adulthood. Allow it ample space to romp, play, and exercise. And always give your cat love and attention. Even with the best care, however, certain hereditary disorders, like epilepsy, cannot be avoided. What Does Panleukopenia, Also Called Distemper, Look like in Cats? What Causes Seizures in Cats? Do You Know How to Recognize a Seizure in Your Cat? How Are Seizures Diagnosed in Dogs and Cats?